Did Game of Thrones Drogon Meets Jon Snow Scene Rip-Off Shrek? If you haven't seen last week's Eastwatch episode of Game of Thrones yet, there will be plenty of SPOILERS below, so read on at your own risk. There was one particular scene in Eastwatch (which set yet another Game of Thrones ratings record despite the episode leaking early online) that fans paid close attention to, showing Jon Snow's (Kit Harington) first up close and personal interaction with Daenerys Targaryen's (Emilia Clarke) dragon, Drogon. While fans know that the dragon responding to him is likely because he has Targaryen blood coursing through his veins, Jon Snow and Daenerys don't know that yet. But one fan noticed something odd about that scene. It matches up surprisingly close to a scene from the DreamWorks Animation hit Shrek. Twitter user The Pixel Factor posted a split-screen video that shows part of this Game of Thrones scene with Jon Snow apprehensively watching as Dany's dragon Drogon lowers its massive head to come face to face with the King In the North. The bottom half of the video is a scene from the 2001 animated blockbuster Shrek, where Donkey (Eddie Murphy) comes face to face with the dragon that would ultimately become Donkey's lover, which culminates with a number of donkey/dragon babies at the end of the movie. While both scenes are quite drastically different in tone, they are shockingly similar in composition. 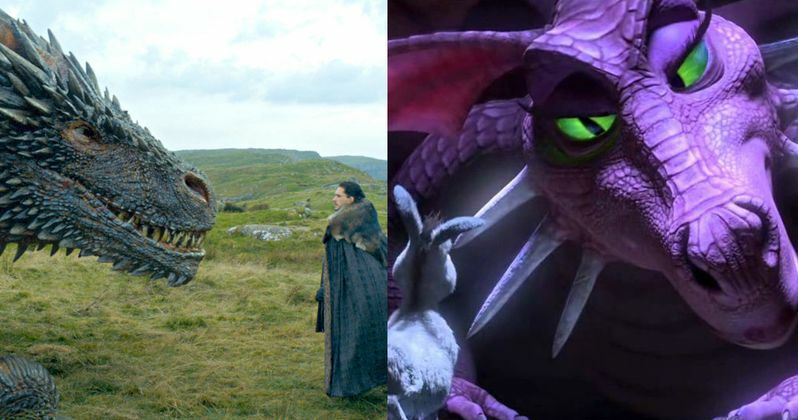 Obviously, it seems quite improbable that Jon Snow will take Drogon as his lover, but another Twitter user pointed out another rather amazing similarity between Shrek and Game of Thrones. Earlier this month, another Twitter user named Katie Hager posted a side-by-side image with Jaime Lannister (Nikolaj Coster-Waldau}), from what looks like the first season of the series, alongside the Prince Charming character from Shrek, and they're quite remarkably similar as well. There is no indication that series creators D.B. Weiss and David Benioff are massive Shrek fans, dropping subtle Easter Eggs left and right, but given these two incredible similarities, anything is possible. It's also rather ironic that Jaime matches up with Prince Charming, since he is not a prince, and charm certainly isn't his strong suit, as we saw in the pilot episode when he pushed young Bran Stark (Isaac Hempstead Wright) out of a tower, crippling him for life. The actual dragon meeting could ultimately be quite important in the overall scope of the series, but Jon Snow doesn't know it yet. Fans have known since the Season 6 finale that Jon Snow is actually the son of Daenerys Targaryen's brother, Rhaegar Targaryen, and Lyanna Stark, Ned Stark's sister. The only person alive who knows this, though, is Bran Stark, who saw it through one of his greensight visions as the new Three-Eyed Raven. Bran Stark has finally come back home to Winterfell earlier this season, where he reunited with Arya Stark (Maisie Williams) and Sansa Stark (Sophie Turner) but one of the first things he said upon his return was that he needed to speak with Jon Snow, presumably to tell him about his true family heritage, which would give him a greater claim to the Iron Throne, since he has both Stark and Targaryen blood. Still, it isn't known when Jon may finally learn about his true family history, since we saw at the end of last week's episode that he made it to Eastwatch, and has set off beyond the wall with Davos Seaworth (Liam Cunningham), Jorah Mormont (Iain Glen), Gendry (Joe Dempsie), Tormund Giantsbane (Kristofer Hivju), Thoros of Myr (Paul Kaye), Sandor "The Hound" Clegane (Rory McCann) and Beric Dondarrion (Richard Dormer). The trailer for next week's Game of Thrones episode, Beyond the Wall, hinted that there will be a great battle between these brave men and the Night King's army of White Walkers. While we wait for that episode to air in just a few short days, take a look at this video and photo that compares Game of Thrones to Shrek.